Morenci Turquoise Cuff handmade by Santo Domingo artist Wayne Aguilar. This stunning cuff features a 68.5 carat Morenci turquoise stone set in sterling silver. The brilliant blue pops from across the room. The cuff measures 5 1/2″ inches from end to end with a 1″ inch opening. 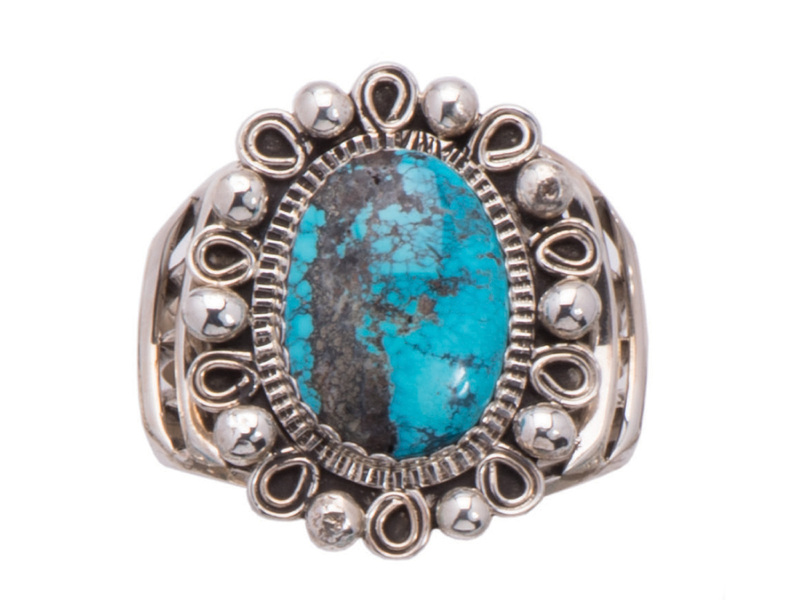 The turquoise stone measures 1 1/2″ inches long by 1 1/4″ inch wide. Moronic Turquoise is mined in southeastern Arizona, in Greenlee County. It is light blue to high blue in color. Morenci has an unusual matrix of irregular black pyrite, or fool’s gold; when polished, the pyrite often looks like silver. It also is sometimes webbed in a darker shade of blue, called water webbed. Morenci turquoise is well known because it was one of the first American turquoises to come on the modern market, and is often difficult to obtain because the mine is now depleted, making it an exceedingly collectible turquoise. Material coming out in the 1960’s seems to be harder, tending more to the blue-greens, usually with the pyrite. In the 1970’s, the material was a much brighter blue, often with quartz along with the pyrite. 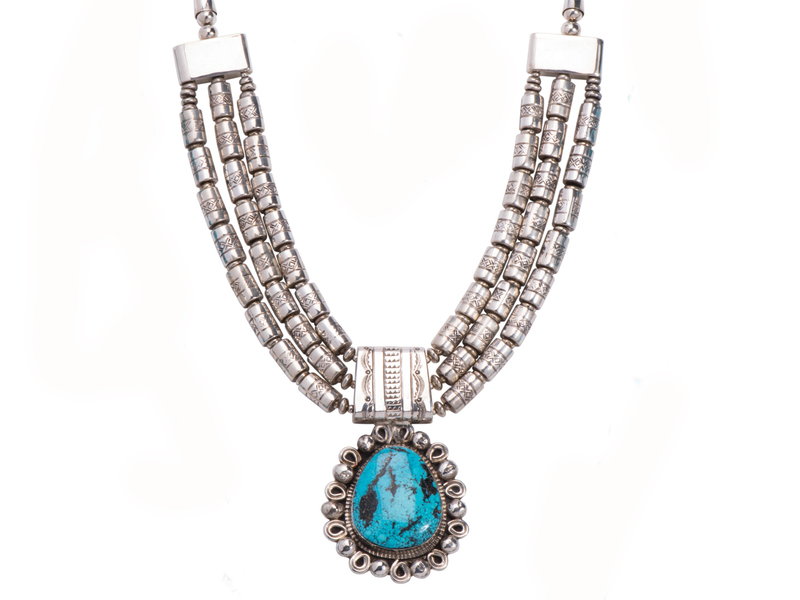 A native of the Santo Domingo Pueblo, Wayne Aguilar grew up watching his parents, renowned silversmiths Earnestine and Tony Aguilar working with brass, silver, coral and turquoise. Aguilar attributes his talent for unique designs and quality craftsmanship to the influence of his parents and to his Native American heritage. I am blessed and successful because of my parents’ guidance,” says Aguilar. Aguilar purchase rough stones from traders, then polishes, shapes, designs and incorporates each stone into beautiful pendants, necklaces and bracelets. Often using brass as well as sterling silver to compliment his exquisite stone settings, he also likes to add a visual accent to each piece he crafts. His trademark is to add one stone or bead of contrasting color on each side of a necklace or pendant. The art of tradition passed down through generations from father to son, mother to daughter, keep alive the Native American treasures we enjoy today. 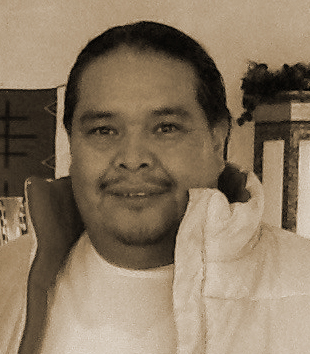 In keeping with this multi generational flow is the craftsmanship of Wayne Aguilar. Deeply rooted in his spiritual and artistic heritage Wayne first began honing his craft at the age of 10 under the guidance of his parents Tony Sr and Earnestine Aguilar. Well known for their fine jewelry making techniques Wayne’s parents never pushed their son, rather gently tutored and mentored him. Raised at the Santo Domingo Pueblo, Wayne learned the spiritual path of the Kiva Culture which strongly influences his jewelry. He blesses each piece with reverence to his parents, his creator and the stones he utilizes. 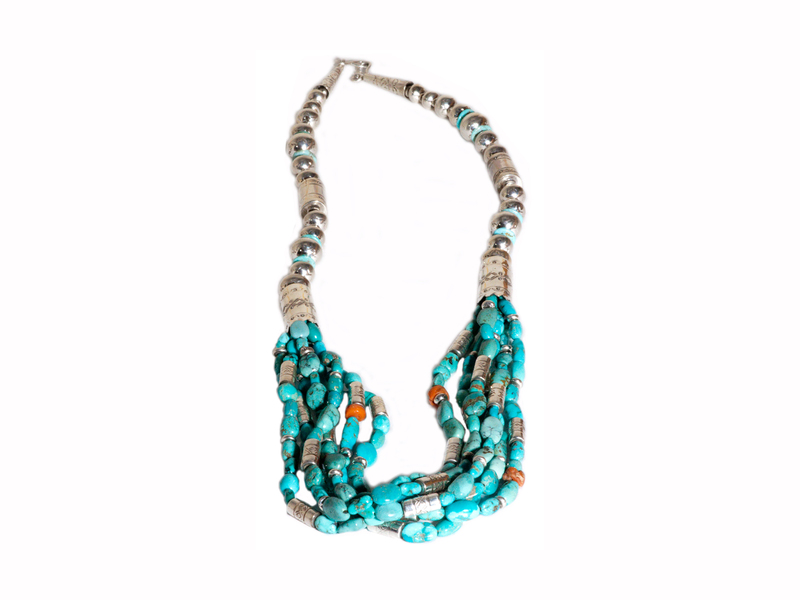 A legacy of turquoise and it’s power is incorporated into his impressive and imposing pieces. These works feel like ancient sacred amulets when worn, as if the strength and power of the artist is a specific gift to the wearer.